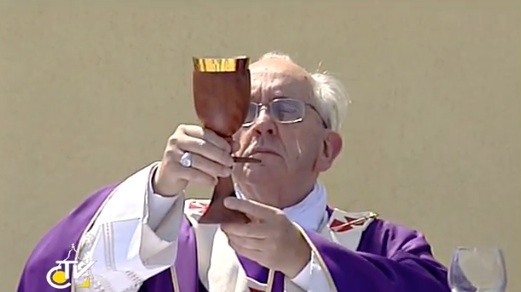 Whispers in the Loggia: "Welcome Among the Least" – On Europe's "Island of Tears," Pope Asks Church: "Where Is Your Brother?" "Welcome Among the Least" – On Europe's "Island of Tears," Pope Asks Church: "Where Is Your Brother?" 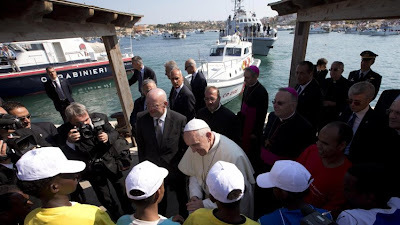 On his arrival by boat at the island's port, the Pope met with several young African migrants, one of whom was tapped to speak for the group in Arabic. Pope: I thank you for this welcome, all of us together today will pray for each other and also for those who are not here with us today. Thank you. Migrant: First of all, we thank the Holy Father for his visit. We would like him to resolve our problem. We fled our country for two reasons: political and economic. To arrive here, in this tranquil place, we overcame many obstacles; we were kidnapped by many traffickers. To arrive here, also again in Libya, we have suffered greatly. We would like the Holy Father’s help and we, after a long period of suffering, we have arrived here; we would like other countries to help us. Thank you for your collaboration and we thank God. We here are forced to remain in Italy because Italy has many refugees. We have stayed, we have digital fingerprints and for this we are forced to stay; we are very many migrants and we would like other European countries to help us. 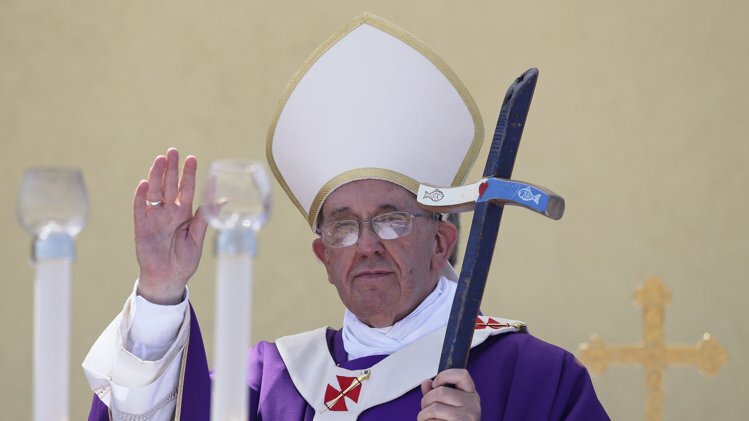 As noted by Catholic News Service, the ritual text employed by Francis was that of a Mass of Reparation ("for the Remission of Sins") in light of the suffering of the innocent, the Pope and his concelebrants – some of whom wore ballcaps to shade themselves from the summer sun – all vested in penitential violet. To underscore the tone of the pontiff's "profound" emotion, which the Vatican referred to in announcing today's quickly-planned visit, Francis likewise donned the papal "mourning" miter – simple white, lined with gold – which, per tradition, a Pope dons only for two occasions: funeral liturgies and Good Friday... until he's buried in it. In the same vein, the monsignori of Papa Bergoglio's entourage hewed to the new script by leaving their purple at home and donning unadorned black cassocks for the day. On leaving the migrant group to head to Mass by means of an open jeep, a lucky TV crew was able to stick a microphone in front of Francis and get his unscripted mind on the moment. "I'm here to pray," the Pope said. "And I want to help."